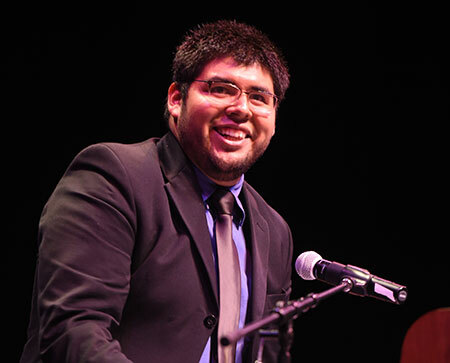 Amid a lineup of high-profile dignitaries speaking at the 2016 New Haven Promise Scholar Celebration, Southern Connecticut State University rising senior Jose Gutierrez may have made the biggest impression. Not only did he garner a standing ovation, he also drew a shout-out from Senator Richard Blumenthal, who implored the 170 new Promise Scholars in attendance to make sure they succeeded at the next level. But it was Gutierrez who connected on a peer level before an audience of about 900 people at SCSU’s John Lyman Center for Performing Arts. He talked about his journey from being a Common Ground High School student without college aspirations to a struggling Southern Connecticut State University freshman wondering if he was cut out for higher education. Gutierrez visited the Promise office that spring semester to make sure he still had the opportunity to rebound and earn the full benefit (he had started with a second-chance Passport To Promise scholarship). Told that he was still in play, he posted a 3.2 grade-point average. “I was proud. I felt motivated and limitless once more,” he said. Taking pride in New Haven and all it offers was a major theme of the night. 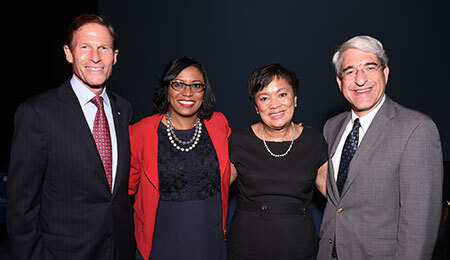 Mayor Toni N. Harp, Yale President Peter Salovey, Promise President Patricia Melton and Sen. Blumenthal each talked about their desire to see the Scholars return to New Haven to launch their careers after graduation. Emcee John Motley repeated the message of New Haven Promise — To. Through. And Back. “I just love that,” said Motley, the former director of the Travelers Foundation who directed the evening’s program with NBC Connecticut’s Leslie Mayes. The program included two award presentations, the annual Legacy Award for recent University of Connecticut graduate Fontaine Chambers and the newly-established Champion Award which went to the Yale University Art Gallery for its leadership in the creation of the Promise Summer Internship Initiative. Kenn Harris — the President of the Board of Directors for the National Healthy Start Association — closed the evening with a keynote focused on the families who provided the foundation for Scholars to thrive. He began working as the Project Director for New Haven Healthy Start as the majority of the 2016 Scholars were newborns or soon-to-be borns. Above is a video produced by Odia Kane, a rising sophomore at UConn, and a number of Promise Scholars who have tried to find ways for incoming freshmen Scholars to save money on campus. It was shown to the 2016 cohort early in the evening. This entry was posted in In the News and tagged Champion Award, Fontaine Chambers, John Lyman Center for Performing Arts, John Motley, Jose Gutierrez, Kenn Harris, Legacy Award, Leslie Mayes, NBC Connecticut, New Haven Healthy Start, New Haven Promise Scholar Celebration, Patricia Melton, Peter Salovey, Richard Blumenthal, Southern Connecticut State University, Tamara Gray, Toni N. Harp, University of Connecticut, Yale University, Yale University Art Gallery by New Haven Promise. Bookmark the permalink.